I’ve heard it through the grape “vine” that today’s free vectors are awesome. 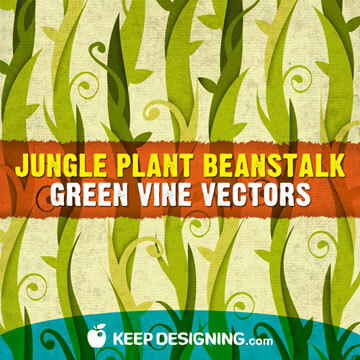 Jack can save his magic beans- because these beanstalk vectors are free. 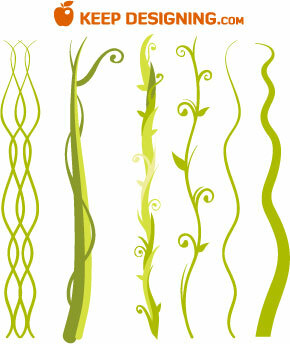 This free illustrator vector download contains six unique vines, beanstalks, and jungle plants. Some are detailed and intricate while others are simple and clean. This free vector download is a free to be used on any personal or commercial work. The free download file works with adobe illustrator 8 or higher. Stay tuned for more great free vectors coming soon. Go Green! Yay! More free vector goodness. Thanks! This is so nice! In my fantasy art, I’ve come across the need for vines several times. Thank YOU! wow man. this is good stuff. thank you for sharing. I commented once, but, I just wanted to add that these work in Photoshop CS3. Adobe files are interchangeable between programs. I only mention this as you state these work in Illustrator 8 and above. Kind of opens up a lot more possibilities, eh? I didn’t know this for a long time! Thanks Su, nice artwork and clever use of our vectors. It came out splendid. We will make a note of the cs3 usage for future posts- thanks. Nice work, thanks for the inspiration. Thank you very much. Those vectors helped me out to get a new job. Thank you so much. Gracias desde un peque�o pueblo de Argentina!